Our judges have spoken and here are the results of our third leaderboard for Miss South Africa 2017. 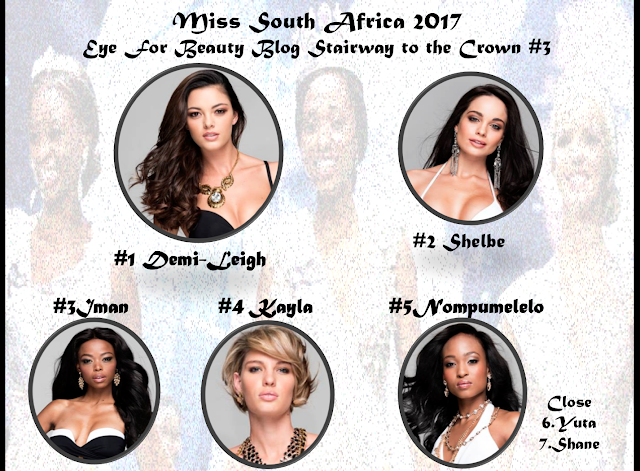 A total of 13 judges voted in this round and the runaway favorite with 57 is still Demi-Leigh Nel-Peters. Shelbe Pretorius followed in second place again with 32 points. Iman Mkwanazi moved up from 5th place to 3rd place with 21 points. Kayla Malherbe is holding steady in fourth place with 19 points while Nompumelelo Mampholo moved two spots down after receiving 18 points in this round. As was the cases with the last two rounds, I did not vote. Next week, I will announce my choices and add my scores to all the votes received during the run-up to the competition. Abongile (South Africa), Albin (USA), Apoloh (South Africa), Aubrey (South Africa), Craig (South Africa), Gordon (South Africa), James (Hong Kong), Jean (Belgium), JT (Philippines), Lex (Philippines), Marina (South Africa), Mathavha (South Africa) and Sarel (South Africa). Special thanks to all our judges!